Can 330ml. @ HBF 2017 [ Helsinki Beer Festival 2017 ], Kaapelitehdas, Talberginkatu 1, Helsinki, Finland. 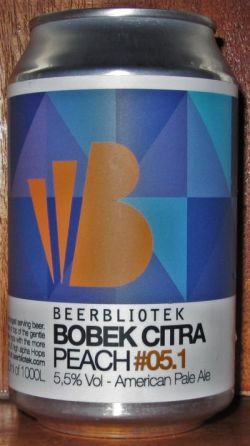 [ As Beerbliotek Pale Ale Bobek Citra - Peach ]. Can from Valhalla’s Goat. Muddy yellow brown, big foamy head. Pine apricot aroma. Dry woody peach flavour. Bitter peach aftertaste. Chewey texture. Quality pale ale. Can @ hbf 2017. Poured hazy golden color with a thin white head. Aroma has citrus, floral notes, hops, some tangerine. Light moutfeel, session stuff. Tangerine, citrus, hops, juice. Some sweetness, very juicy. Can from Bridgend Services. Hazy orange body with lots of sediment floating beneath a thin white head. Steady carbonation. Faint lacing. Aroma of tangerine, green stalks and peach. Flavour of nectarine, Rich Tea biscuits and apricot. Medium body with a smooth texture. Soft fizz. Refreshing and fruity. Can from Cotteridge Wines; cloudy golden yellow pour with a big frothy off white head, aroma has hints of peach and some tangerine, taste has creamy malts, some grapefruit, tinned peaches. Can at home. Pours golden orange, nose is sherbert lemon, peach, toffee, taste is juicy fruit, sweet, refreshing. Can from westhill service station. Pours a cloudy orange gold with a small white head that fades. Quite a bit of sediment. Aromas of juicy peaches, nectarines, zesty lemons, herbs and pine. Flavour is juicy citrus, peaches and a biscuit and bitter pine finish. Lys brun tåkete med lavt hvitt skum. Lukter humle, blomster og mye fersken. Middels fylde. Lett bitter. Smaker fersken, lett karamell, honning og blomster. Kort.